"I think they need to get their act together by the beginning of football season. And I think that they basically have until next year's Super Bowl." ESPN’s new morning show Get Up is not off to the start anyone in Bristol would have dreamt up for it. One week in, the reviews have been lukewarm and, more troublingly, the ratings have been fairly awful, down 24 percent over its first four shows from last year’s programming in the same time slot. And although it’s too early to declare Get Up a lost cause… a lot of people are already wondering whether Get Up is a lost cause. I think they need to get their act together by the beginning of football season. And I think that they basically have until next year’s Super Bowl. I don’t think anything’s going to happen, no matter what the ratings are. That said, it’s interesting to see what Pitaro’s patience level is going to be with it versus Skipper’s because Skipper gave birth to this, and if he were still there, I think they would have had, certainly, at least a built-in margin for error that they may not necessarily have with that. Deitsch asked Miller about the report that the three Get Up co-hosts — Mike Greenberg, Michelle Beadle and Jalen Rose — make a combined $14.5 million in salary, but Miller said that wasn’t his (or ESPN’s) chief concern. They need to make this show work. They need to make this show work not just in justifying the salaries but here’s the thing: If this show doesn’t work, ESPN, when they’re next in conversation with a piece of talent at Fox or NBC or CBS saying ‘Come over to us and we can be the home for you that you really want. You want your own show or you want to raise your profile or something. We can do that.’ Well, they need to be able to prove that. I think there’s a lot at stake just in terms of the world of ESPN. This network needs to be able to deliver a successful show. It’s just as simple as that. Yes, it’s hard to deliver it and all that stuff, but there’s gotta be a lot of smart people over there who have the ability to take talent that they believe in and talent that has received a lot of support from the audience before and turn it into a successful TV show. If they don’t, then I think that’s a real problem for them, beyond the salaries. The salaries are significant, but beyond the salaries, if you fail at doing this show, the ramifications are serious. To Miller’s point, ESPN has put a lot of money, manpower, and promotion behind Get Up, and if three high-profile personalities, a prime time slot, and a massive ad campaign aren’t enough to make it work, that certainly won’t reflect well on the network. 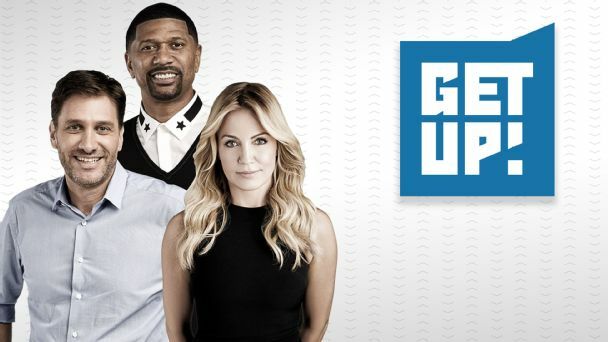 With all that in mind, it’s safe to say that if Get Up’s ratings remain low, ESPN will consider changes to the show’s content, structure, promotional strategy or even personnel. Yes, it’s early for Get Up, but given the ratings and the bad PR that has come with them, the network might not wait too long before making some moves. Miller’s conversation with Deitsch is pretty interesting start to finish, as the status of Get Up at length before moving on to the details of Skipper’s exit and other subjects. You can listen right here.